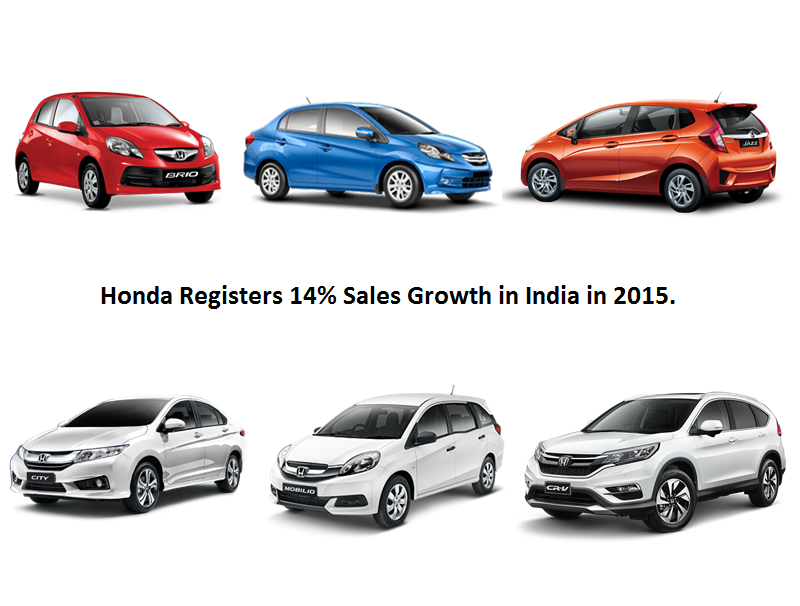 Honda Cars India Ltd. has registered a cumulative sales growth of 14.9 per cent at 1.90 lakh units during the January-November period this year. Mr. Jnaneswar Sen, Senior Vice President, Sales and Marketing, HCIL, stated, "HCIL has grown by 14.9 per cent during the January- November 2015 with cumulative sales of 1,90,024 units as against 1,65,388 units for the corresponding period last year." In India, the Japanese carmaker portfolio includes Jazz and Brio Hatchback, City and Amaze Sedan, Mobilio MPV and Premium SUV CR-V and for the same carmaker has sold over 1,90,000 units till November this year against the 1,79,816 units in 2014 with strong sales coming from its best selling products namely Jazz, City and Amaze. In November,2015, the Indian arm of Japanese car maker has sold 14669 units that include record sales of Amaze and City as 4,106 units and 6,342 units respectively, 461 units of Brio, 3,367 units of Jazz and 393 units of its MPV Mobilio.